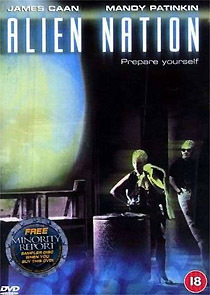 The 1988 film Alien Nation, about a race of alien immigrants who arrive on Earth, only to be ghettoised and victimised, has aged well, mainly because fundamentally it’s a traditional buddy cop movie, with only notional SF trappings. The disc is presented in a ratio of 2.35:1 (16:9-enhanced), and is generally acceptable. The film has 4.1 audio (left, centre, right, subwoofer and mono surround, at 384kbps). About ten minutes of interviews and behind the scenes material, the theatrical trailer and three TV adverts are also presented.